During one of Dellor’s Apex Legends streams, he was playing with random teammates. At one point of the match, Dellor was downed and waiting for his teammate. That’s when things started to turn ugly. Watch the interaction between the two. Dellor is a full time streamer who currently streams Apex Legends, the new hit Battle Royale game. He’s mostly known for his raging in-game, screaming at the top of his lungs when he doesn’t get his way. Most of the time it’s when he gets killed in an annoying way does he goes on a tantrum. Prior to his full time streaming, Dellor, whose real name is Matt Vaughn, was a professional esports player. He use to play games like PUGB and Overwacth competitively, until he faced some heavy controversy for screaming out the N-word. Dellor was kicked off his esports team for this remark, and never returned to competitive gaming. He currently plays Apex Legends, streaming for his 300k Twitch followers. And he’s not bad at the game, having set certain achievements in the game, which he has pinned on his Twitter page. 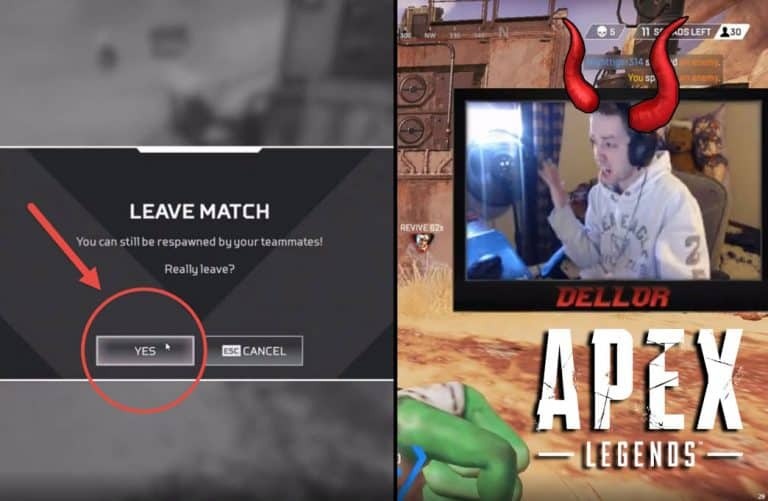 During one of Dellors recent Apex Legends streams, he was caught in a tough situation. Landing in Skull Town at the start of an Apex Legends match means you are ready to get into a brawl, as this is possibly the most enemy traffic area in the game. When you land in Skull Town, finding a weapon within the first few seconds will make a difference between staying alive or getting eliminated. In this case, Dellor was able to drop in a good area and pick up a Devotion (an energy heavy machine gun). 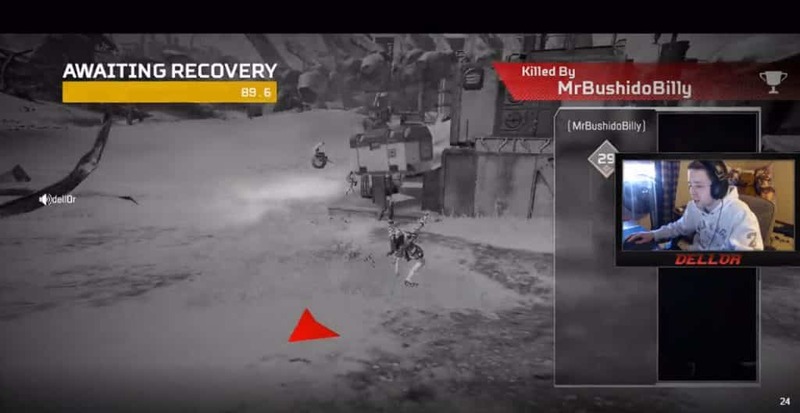 As he took out a couple of players, one of his teammates were already downed by an enemy, while his other teammate was running around trying to find health. At this point. Dellor was chasing the enemy who downed his teammate outside. He was then surprised by a second enemy from a distance which he started to focus on. The original enemy he was chasing came out from the side and started shooting at Dellor. At this point, Dellor was loosing health, and was shot from two enemies and then downed. He then tells his teammate who was away from him that “they’re both 1 HP, both 1 HP”. Read: HeyImBee Has Awkward Moment with Teammate. Gets called “Fortnite Kid”. Dellor then looks to see where his teammate is and sees he’s far away. His teammate can then be seen going into a few rooms to find health and says, “Got no health.” This agitated Dellor as he knew the enemies had low health also and would go down with a few bullets. He then screamed out, “Just go in, they don’t either!”, referring that they don’t have health either. “Hey if you’re gonna scream like that I’m not gonna play”. That’s When Dellor lost it and said, “Good f*** you. F***ing die” to his teammate. He then proceeded to exit the game. Just before he left, his teammate responded with, “Why you gotta be so angry”. In Dellor’s case, this is something his followers are use to seeing. The rage gamer coming out when things don’t go his way. Dellor, as usual, then stands up and paces around in anger. Some might think this is for show, in order to keep viewers engaged. It could very well be his approach of engagement for his channel. But all we know is that it works, and his viewers get a kick out of his raging moment.